Water, Glycerin, Sesame Seed Oil, Isopropyl Isostearate, Ethylhexyl Palmitate, Petrolatum, Cetearyl Alcohol, Panthenol, Glyceryl Stearate, PEG 100 Stearate, C10 30 Cholesterol/Lanesterol Esters, Dimethicone, PEG 10 Soy Sterol, Triethanolamine, Carbomer, Tocopherol, Diazolidinyl Urea, Methylparaben, Ethylparaben, Propylparaben, Tetrasodium EDTA. Can deal with extreme flakiness. Makes your skin greasy and shiny. Caused horrible breakouts. 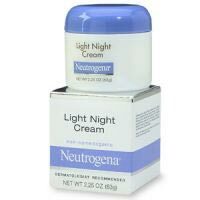 Used this moisturizer for ~2 weeks to cope with major flakiness that started with winter. It caused the worst breakout I've had in years. Had to scale back my skin care routine to something less drying and switch back to my regular moisturizer. Not worth it.